This article looks at some turning projects suitable for your kitchen and dining room. 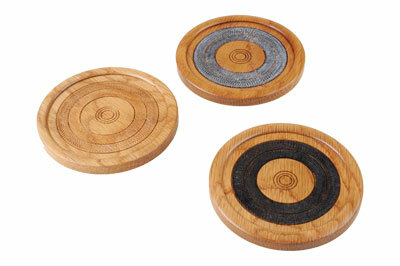 For the coasters I have used oak (Quercus robur). They could be left natural timber should you wish, but I have chosen to apply a decorative detail. I have left two uncoloured, and applied black to the patterned areas on the remaining four, two of which have had liming wax applied to fill the scribed pattern. 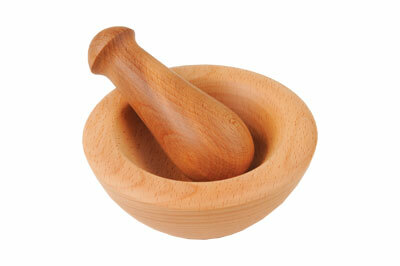 'Clean' beech (Fagus sylvatica) has been used for the pestle and mortar, i.e. beech without spalting. The mortar has been made with a wide base and thick wall to give stability and weight to the piece. This makes grinding spices easier. Both have been finished with food safe oil. 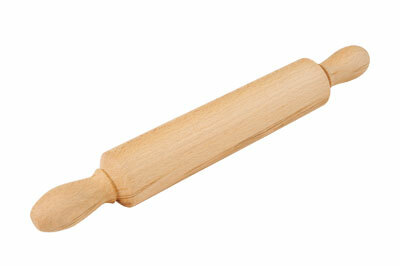 The rolling pin has also been made from 'clean' beech and is finished with food safe oil. 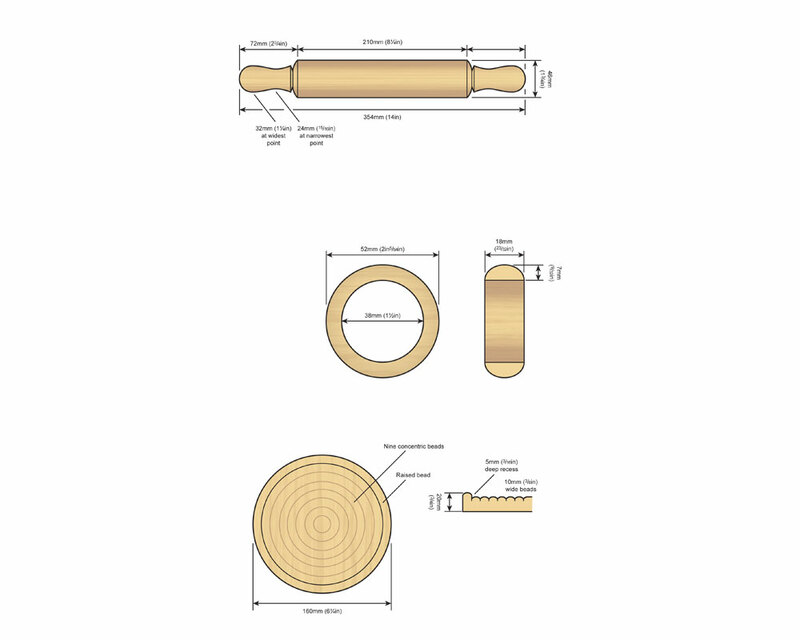 It is important to turn the rolling pin parallel and uniform in diameter for ease of use. The length of roller and handles can be altered to suit your requirements. Yew (Taxus baccata) log has been used to make the serviette rings; should you wish to see more of the heartwood you will need to use a larger log. They have been finished with sanding sealer and then buffed with a three-mop buffing system. They can, of course, be re-buffed should they become dull. I have chosen a piece of elm (Ulmus procera) for the teapot stand. A raised bead detail has been used to avoid the teapot from slipping off the coaster. A recess containing concentric beads will help to disperse the heat. Finishing oil has been applied for heat and moisture protection. All these items can be altered either subtly by using different timber or more noticeably by changing the proportions, and pattern applied to the individual piece. Take two pieces of oak measuring 100mm diameter x 50mm thick. Mount one of them on the lathe and turn into the round. Face up the front edge and cut a 2mm deep recess approximately 8mm in from the edge. Use a negative-rake scraper to ensure the surface is flat. Sand to a finish and use a pencil to mark where the patterns will be formed. Use an offcut of timber as a template for marking these positions. Using a three-point tool, cut grooves on these pencil marks, then using a detailing tool, scribe a pattern between these grooves. I used a Henry Taylor Decorating Elf with the oval and barrel cutters, which both give a different scribed pattern. Reduce the speed of the lathe to approximately 800rpm and push the tool into the timber firmly to scribe a pattern. Re-cut the grooves to tidy up the edges and using the stiff brush that comes with the tool, remove any raised grain. 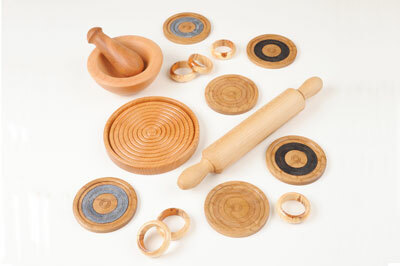 If you choose to add colour, apply while on the lathe, reduce the speed to approximately 250rpm and apply the colour. 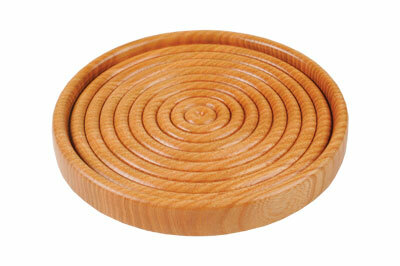 Tidy any overspill before parting off the coaster using a 1.5mm fluted parting tool. Turn the remaining five in the same way. Turn a jam chuck to receive the coasters for tidying up the underneath. It is advisable to drill a hole down the centre of the jam chuck large enough for a pencil or similar to fit through, as this will help with removing the finished coaster. Cut the depth of the jam chuck to 9mm deep and finish each coaster to that thickness. Cut a couple of grooves or some other detail as proof you have been there. Applying several coats of oil will offer some heat and moisture protection. Take a piece of beech measuring 50 x 50mm x approximately 355mm long. Mount between centres and turn into the round. Using a skew chisel, take a refining cut, ensuring the cylinder is parallel and an even diameter along its length. Hold a steel rule across the surface to check for level. Using a fingernail-profile spindle gouge, turn two matching handles, reducing the excess timber at both ends as much as possible. Sand to a finish and use a hacksaw to cut off the excess timber. Using a sanding disc mounted on the lathe, sand away the excess timber leaving a flat at each end. When sanding, keep the timber moving and try to avoid too much heat build up. Apply food safe oil to finish the piece. 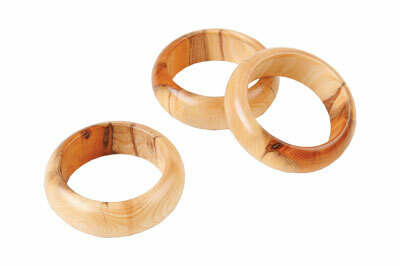 A log of yew measuring approximately 63-75mm diameter x approximately 150mm long is needed for the serviette rings. Mount between centres and turn into a cylinder. The finished size of this cylinder will determine the overall diameter of the rings. Cut a chucking spigot at one end and mount in the chuck. True up the end and using a sharp Forstner bit or sawtooth bit, drill a 38mm diameter hole, to a depth of approximately 25mm. Try to avoid getting the timber too hot. If heat builds up you can withdraw the drill and allow the timber and drill to cool. I used compressed air to reduce the heat. Shape the serviette ring making sure not to part through to the hole. Sand to a finish, apply sanding sealer and part off the ring. Continue shaping the other rings using the same process. When all the rings are turned, turn a jam chuck to fit the internal diameter - not too tight a fit - and approximately half the width of the ring. This will make it easier to remove the finished ring. Mount each ring in turn on the jam chuck and tidy up the parted off section, sand to a finish, apply sanding sealer and remove from the chuck. Buff to a glossy shine using a three-mop buffing system. You need two pieces of beech for this pestle and mortar: one piece measuring 150mm diameter x 63mm thick, and the other 50 x 50 x 150mm long. 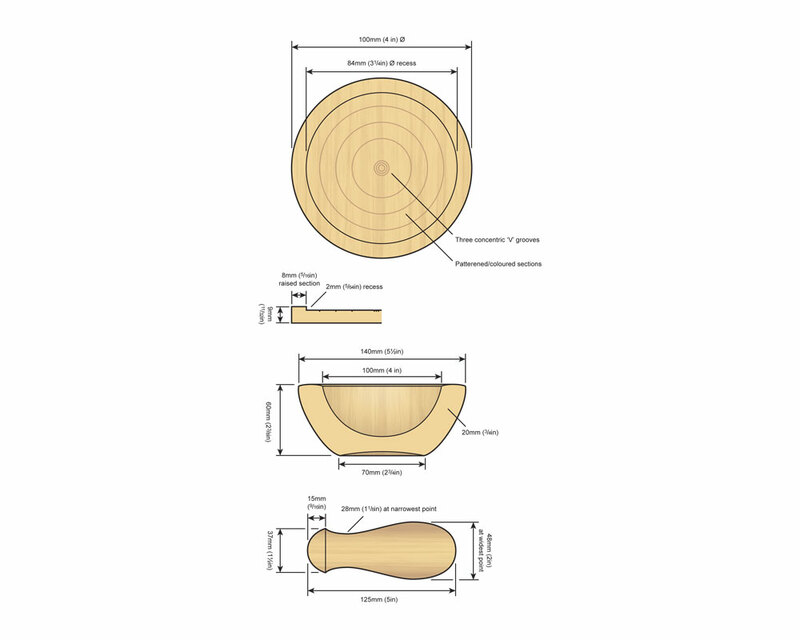 For the mortar mount the 150mm diameter piece of timber on the lathe and turn into the round. Cut a chucking spigot for re-mounting and shape the outside. Sand to a finish and remount using the chucking spigot cut earlier. Cut out a deep bowl with a curved bottom leaving a wall thickness of approximately 20mm; this will give the bowl the strength and weight needed for grinding spices, etc. Sand to a finish and remove from the lathe. Using a set of jumbo jaws, a compression jam chuck or vacuum chuck, mount the bowl on the lathe and remove the chucking spigot. Slightly undercut the foot, sand, and apply food safe oil to finish. For the pestle mount the second piece of timber between centres and turn into the round, then cut a chucking spigot at one end. Mount in the chuck and shape the grinding end. Taper down towards the handle and shape the top, leaving approximately 12mm thickness to offer support for sanding. Sand to a finish and either part off using a parting tool or if you feel comfortable with a skew chisel, refine the shape gradually reducing the diameter of timber holding the pestle on the lathe. For the final cuts gently hold the pestle for support. Mount a sanding arbor in your chuck and gently sand the top smooth keeping the rounded shape. Finally, you just need to apply food safe oil to finish the items. For this project, you need to take a piece of elm measuring 165mm diameter x approximately 22mm thick and mark the centre. Next, mount on a vacuum chuck using the marked centre to centralise. True up the face, slightly undercutting and turn a bead detail. Sand the piece to a finish and remove from the lathe. Remount on the vacuum chuck, turn into the round and cut a 10mm bead detail at the outer edge. Using a bedan or similar, cut a 5mm recess to the centre, leaving the bead detail, at the outer edge, standing proud; this will prevent the teapot from sliding off the coaster. Using a bead former or spindle gouge, cut concentric beads all the way to the centre of the piece; this will disperse the heat generated by the teapot. Working through the abrasive grits, sand, taking care not to change the shape of the bead details. Remove from the vacuum chuck and apply several coats of finishing oil to give the teapot stand some moisture and heat protection. If you do not have a vacuum chuck, glue on a sacrificial chucking spigot to one side and mount on the lathe, turn into the round and true up the face. Finish the underneath as much as possible and cut a recess, the correct size for your chuck. Remount using this recess and true up the face. Turn the outer edge bead detail and cut the recess with concentric beads, as described above. Remove from the lathe and remount using either a jam chuck or jumbo jaws to remove the chucking recess. Sand to a finish and apply finishing oil.